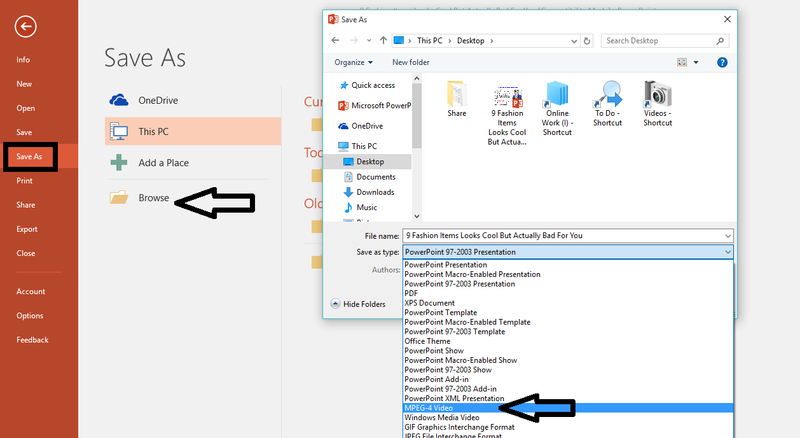 There are two way to convert PowerPoint Presentation into video, one is, save as and another one is export, these option are available in office 2010, office 2013 and office 2016, unfortunately these option not available in office 2003 and 2007. 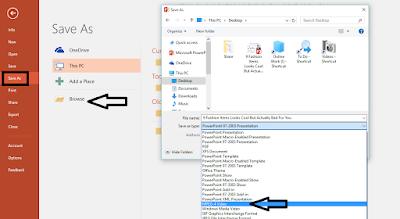 But in office 2010 and higher version you can save your ppt as video. 1. First method is: open your PowerPoint Presentation file click on “file” – “Save As” than click on “Browse” to choose your file location and in “save as type” option select “MPEG-4” or “Windows Media Video” and click on “save” after this your file will start to convert into video you can see progress in bottom of ppt. 2. The second method is, go to “file” – “Export” – “Create a Video” select your video quality, if you want record timings and narrations than click on “Record Timings and Narrations” after this click on “Create a Video”.